(Little Swimmers 1: Students 3-5 years) Learn basic water skills including float, glides, kicking and water safety. There are no pre-requisites for this class. (Students 4-5 years) Build on basic water skills. This course helps students develop independence with their floats, glides and kicking. Students entering this course must have a Little Swimmers 1 certificate or be able to demonstrate all the requirements for Little Swimmers 1. (Level 1: Students 5-9 years) No water experience needed. Students will learn basic water safety and skills to help them feel comfortable and enjoy water. (Level 2) Students will learn to float without support and recover to the vertical position. Additional skills learned include bobbing, breath holding, rhythmic breathing, opening eyes under water, and alternating and simultaneous arms and leg action front and back. Students must have completed Little Swimmers program or be able to demonstrate Level 1 skill requirements. Students learn to coordinate the front and back crawl, butterfly, and treading water fundamentals are also introduced at this level. Students entering this level must have a Level 2 certificate or demonstrate all of the requirements for Level 2. Students develop confidence and endurance to improve the butterfly and front crawl for greater distances than in Level 3. 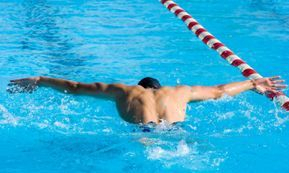 Elementary backstroke, breaststroke, elements of the sidestroke, and turning at the wall are introduced at this level. Students enrolling in this level must have a Level 3 certificate or demonstrate all requirements for Level 3. Students with long hair should have it pulled back or in a swim cap. Students and parents should wait along the wall prior to lessons starting. Students should meet in the area designated by their teacher. Students should be showered and ready when their class is called. Parents, siblings and friends should not disturb swimming students and may be asked to exit the pool if necessary. A swim waiver form needs to be signed and on file for each child and payment needs to be received no later than 3 days prior to the start of a session. Cancellation: If a lesson needs to be cancelled, a makeup session will be added on at the end of the session. A minimum of 3 children need to be in each class for the class to run, if a session is to be cancelled, parents will be notified 3 days prior to the start. Questions or Private Lessons! Contact Angie G.